Rnd 1) Ch 6, jn with a sl st in first ch to form a ring. Ch 5, (counts as first dc and ch-2). (3dc, ch 2) three times, add 2 more dc into the ring and jn with a sl st in the 3rd ch of the first ch-5. Sl st to the nearest corner. Rnd 2) Ch 3, (counts as first dc), (2dc, ch 2, 3dc) into this same corner. Ch 1. (3dc, ch 2, 3dc, ch 1) in each corner. Jn with a sl st in the first ch-3. Sl st to corner. Work 10 tr in the center ch-1 space of the closest side. Sl st into the corner. Work 10 tr in the next center ch-1 space, and sl st into the next corner. Jn with a sl st in the bottom point of the heart. Ch 3, sc in 2nd ch from hook, sc in the back loops of the next 3 sts. Sl st into the next ch-1 space, ch 3, sc in 2nd ch from hook, sc in the back loops of the next 3 sts. 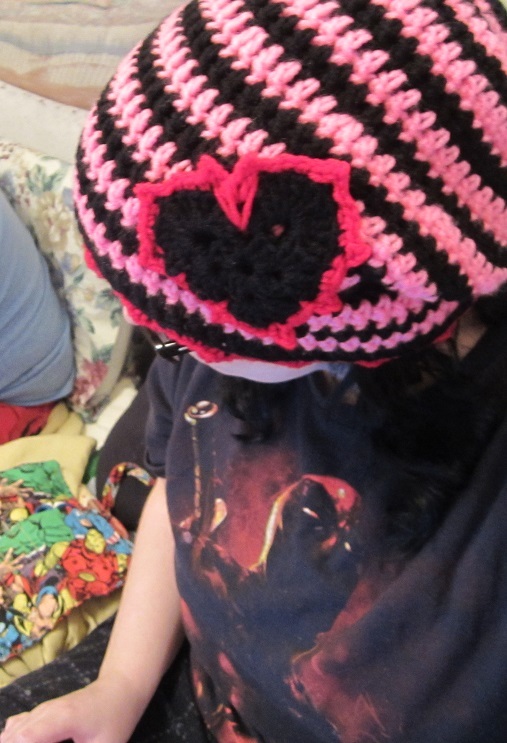 * Working in back loops, (sl st in next st, ch 3, sc in 2nd ch from hook, sc in next 3 sts) twice. Still working in back loops only, sl st into next st, ch 3, sc in 2nd ch from hook, sc in next st. Repeat from * once to work around the second arch. Sc in ch-1 space. Working in back loops, sc in next 3 sts. Sl st in next ch-1 space, ch 3, sc in 2nd ch from hook, and still working in back loops sc in the las 3 sts. Jn with a sl st in the bottom point of the heart. Fasten off. 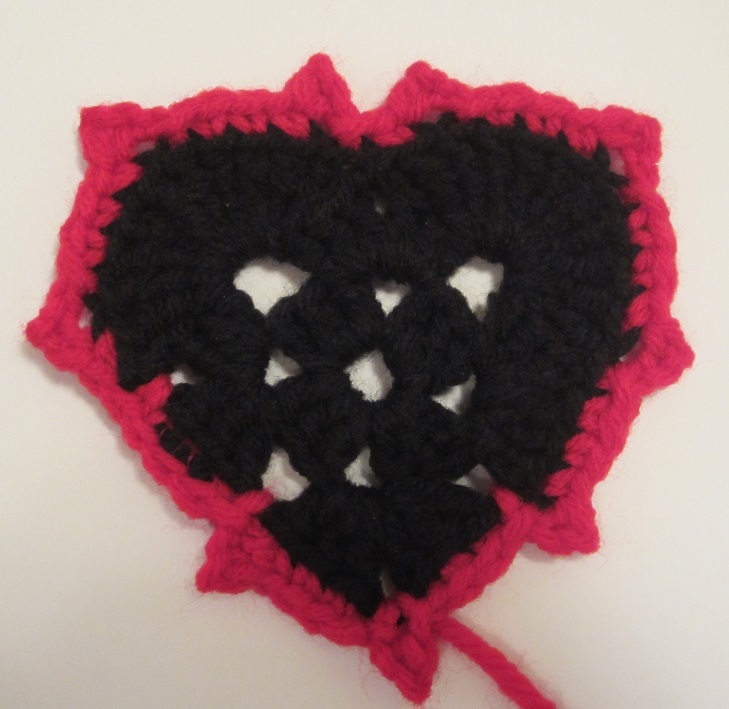 This entry was posted in Uncategorized and tagged Craftyghoul, crochet, emo, free, goth, heart, how to, Love, luv, luvz, pattern, scene, Starling, thorn, thorns, thornz, valentine, Valentine's Day, zombie. Bookmark the permalink.